I adore Japanese hotcakes (Japanese style pancakes). They are sweeter and fluffier than the regular American style pancakes I grew up on. 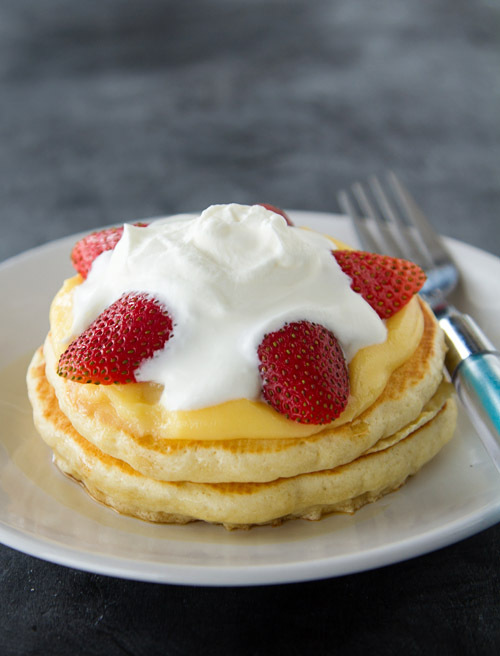 In Japan there is an uber popular hotcake mix made by Morinaga that makes perfect fluffy hotcakes every time, and seems to be the way most people in Japan make hotcakes at home. There are even lots of books that use hotcake mix as an ingredient. 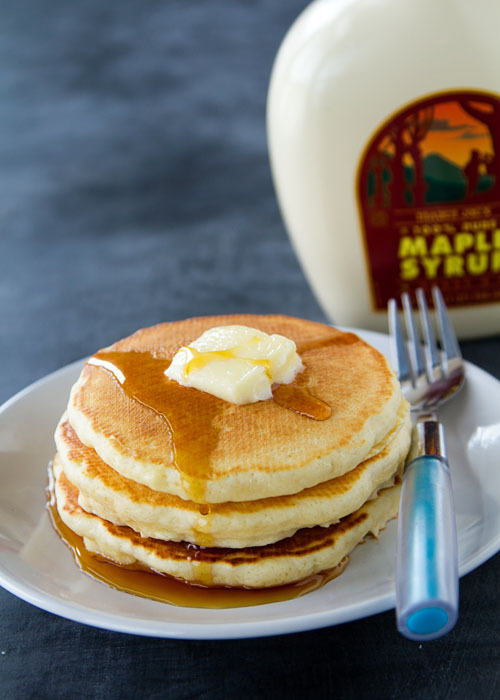 When we moved back to the US, after living in Japan, I searched for a recipe for hotcakes so that I could make them from scratch, trying many over the years, but always being disappointed. Then a couple of years ago my friend Noriko sent me her recipe for hotcakes, thereby ending my hunt for the perfect hotcake recipe. The recipe is perfect. I’ve fiddled with techniques since she sent me the recipe and have finally settled on my favorite. 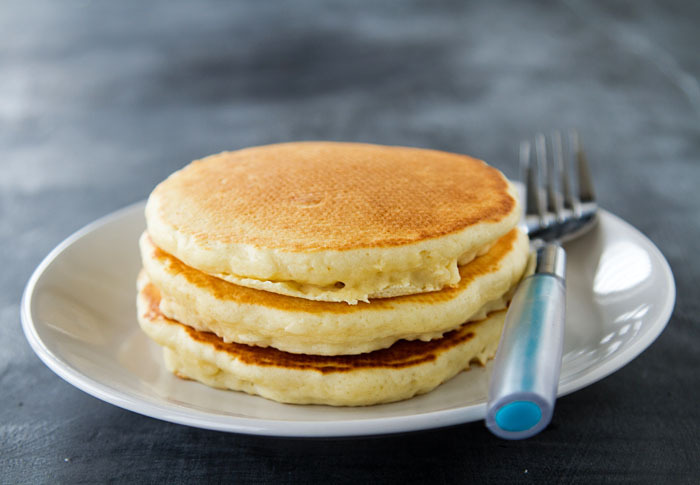 Then my friends at Zojirushi sent me their new Gourmet Sizzler Electric Griddle to try out, and I decided it was a sign that it was time to share the hotcake recipe with you. This griddle, is amazing, by the way. I’ve tried out other griddles, but have always found them a bit cumbersome and a complete pain in the backside to clean. 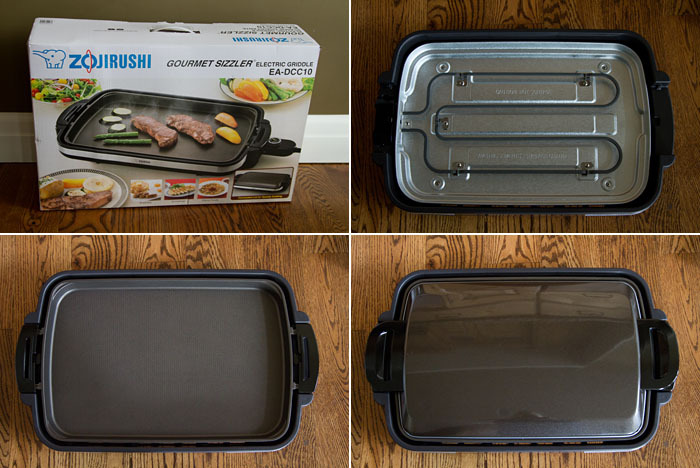 The cooking plate on Zojirushi griddle is ceramic, and lifts out so that it can be completely submerged in water for cleaning, making it a breeze to clean up. The griddle also comes with a lid, so that you have the option of covering cooking items to help speed up cooking time. The griddle is on the large size, making it a bit cumbersome, but in this situation it’s an advantage, because the cooking surface is nice and large, making it possible to cook up lots of things at once. I was comfortably cooking 5 large hotcakes at a time. 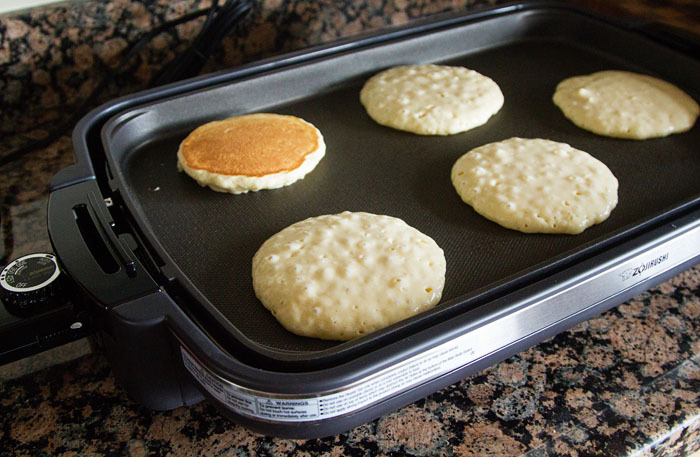 The advantage of using an electric griddle when making hotcakes, is that you can set the temperature on the griddle, then cook the hotcakes at a constant temperature. This helps deliver perfect hotcakes! I am a huge fan! These are fabulous served with a bit of butter and maple syrup. 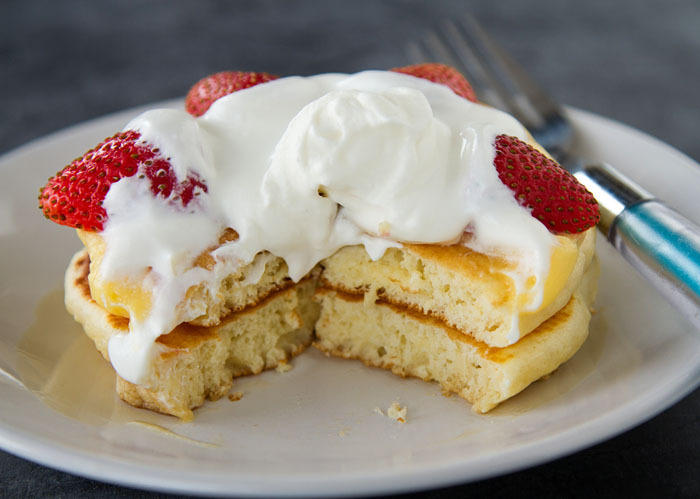 Noriko also reminded me of the way they serve hotcakes at the Fujiya restaurants in Japan—with a bit of custard, fresh fruit, and a dollop of whipped cream. If you’re looking for a special holiday breakfast, this is beyond divine. 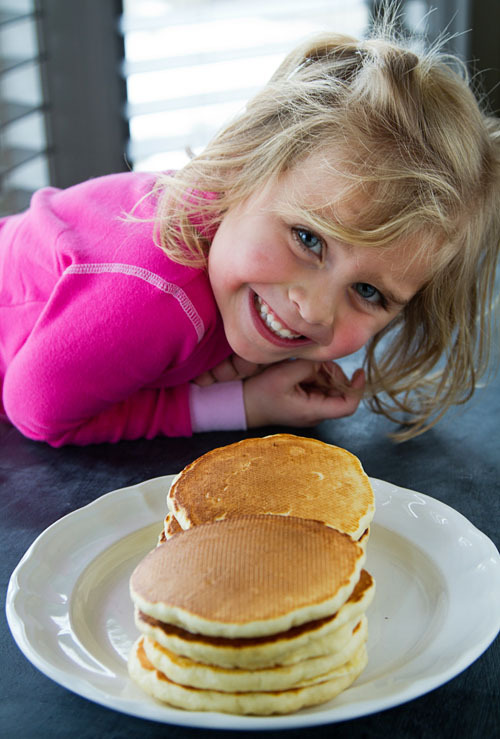 *Recipe Notes: The best way to make the batter for these hotcakes is by using a kitchen scale. I’ve experimented with using cup measurements, and I’ve had very mixed results, since the weight of a cup of flour, for example, can be drastically different depending on how you measure it. If you stick the measuring cup into your flour bin and scoop out your flour, your going to end up with a lot more flour in that cup than if you were to spoon your flour into the cup. The weight measurement helps reduce the margin of error. 1. Beat the eggs, milk, and vanilla extract together until foamy, about 3 minutes at high speed using a hand or stand mixer. 3. Set an electric griddle to 375 degrees Fahrenheit, or heat a heavy frying pan over medium heat. Lightly grease the griddle or frying pan. 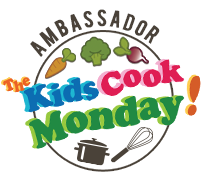 The griddle/pan is ready to use if a drop of water will skitter across the surface, evaporating immediately. 4. Ladle 1/4 cupfuls of the batter onto the griddle. Cook on one side until bubbles begin to form and break, about 2 minutes. Then turn the pancakes and cook the other side until brown, about 1 1/2 to 2 minutes. Turn over only once. Serve immediately. Delicious drizzled with maple syrup, or topped with custard, fresh berries, and a dollop of whipped cream. You will love them Linda! Thank you for the recipe!! I’m so happy i no longer have to stock up ホットケーキ mix!!! I usually add very ripe banana to make extra fluffy hotcakes. I am so glad Hiroko!! I love the banana idea. I will have to try that next time I make hotcakes!! 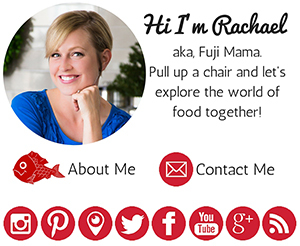 I think I’m going to have to make a batch of hotcakes…and also make a trip to Fujiya. I know, I love how the electric griddle makes them so pretty! Great recipe. Grand mom made these every weekend. This is a very old PA Dutch recipe. She also subbed cornmeal in to make a fluffy corn cake. Served with homemade apple butter was a very tasty treat. 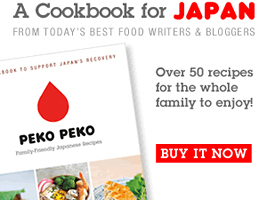 I have been looking for a Japanese Hotcake Mix recipe for FOREVER! Thank you SOOO much for posting this! This recipe looks fantastic!I have a question, I was wondering if using cake flour would result in any difference texture wise or affect the density of hot cakes (less dense/more dense, fluffy/less fluffy)? Thank you so much! Iam looking forward to try it out. I stumbled upon the Hot cakes when was reading another recipe that require 1 pack of Hot Cake Mix. Would your recipe produce the same amount as 1 pack or should it be divided/multiplied? Thanks a lot! This was such a wonderful recipe! Quick and easy breakfast for my family. We topped ours with whipped cream and blackberries. I was hoping you had the recipe for the savory Japanese pancakes. I will continue making my own. What is the savory pancake? It is a plain flour batter, but you mix in green onions, bonito flakes, shredded cabbage, and a hint of fresh grated ginger. Then cook on stove top as a pancake. Once cooked, the pancake is brushed with its sauce of rice wine vinegar and soy sauce. In Japan are little neighborhood shops that make only this food. おいしそう！！I just found it and love it! Having lived a while in Japan, now that I’m back in my country, I really miss the Morinaga hotcakes mix!! I made this recipe for Sunday breakfast today. I used a “Tiger” brand table-top griddle, very similar to the Zojirushi one you used. The hotcakes came out perfect, and made my Japanese wife very happy. She said they reminded her of when she used to get hotcakes with her mother 40 years ago. なつかしい! Thanks for the excellent recipe! I was really looking forward to making these, because I’ve seen many a picture of Japanese hotcakes before, and they looked too good to be true. I was actually going to buy Morinaga’s mix, but it was 7 dollars, and, lo and behold, I found this! And… oh god. They somehow had no flavor; and to make matters worse, they tasted really dry… or, I don’t know, like eating something that wasn’t really food. The texture was really weird. Even generous amounts of butter and syrup couldn’t help these… not even jam. I was most distraught. Is the amount of sugar correct? I only ask since you said they were sweeter than pancakes you’ve had… and all of the pancakes I’ve eaten have been much sweeter than this. Oh my God! I love the hotcakes! I’m a big fan of all types of pancakes but never tried so delicious ones! I don’t fry them on electric griddle but on pancakes frying pan and they still are great! Thank for the recipe!!! hi do you think this recipe will work for steaming? i have been trying to look for a steam cake recipe..which i dunno why it alwys turn out hard though recipe is so simple. as i seen many bloggers use the morigana hotcake mix to make the steam cake.i prefer not to use premix too so just wondering whether your recipe would do in this case? by the way, wonder can use cake flour? Just did this recipe. The hotcakes came out somehow dry but tasty. Maybe adding a pinch of salt or butter could help. I did them on stovetop and came out perfect. I’m not sure actually! I’ve never done a volume comparison. The next time I’m somewhere that sells Japanese hot cake mix I will have to do one! I made these this morning! they were so tall and fluffy, with a nice crispy outside. there’s no salt in this recipe so i’d really recommend topping it off with lots of salted butter. pancakes are always best fresh off the griddle so serve them immediately. I’m definitely making these again! Thanks for the recipe, finally I’ve found the great tasting pancake however mind hasnt rise as high as yours, may I ask why? Is it because I over mixed my batter? I made in a frying pan and it worked wonderful! Mine got a bit dry but I think it is because I messed up the temperature while doing. It was delicious with vanila ice cream, marple syrup and berries and it really tasted like the japanese hot cake mix. Happy to find this recipe. Many thanks! I’m so glad to hear it! Thank you for taking the time to come back and comment! This recipe is what I am looking for on Japanese style hotcakes. They are great, and highly recommend using a hand or stand mixer when mixing the ingredients together in order to make it fluffy. First time making it by whisking it by hand, but may require little longer on time. I also changed the measurements in flavoring, I used 1 Tablespoon vanilla extract instead of 1 teaspoon. There is also a chemical reaction between milk, eggs and baking powder in order for hotcakes to be fluffy and kind of soft. I use MEDIUM LOW heat for my electric induction stove top for constant temperature, and cooked for 1 minute on each side. When seeing bubbles appear and sides look and become dull looking, I flipped it over once and cooked on the other side for 1 minute. This will be part of my weekend brunch menu. Thank you for sharing the recipe. I just made these and they’re pretty good. I substituted milk for buttermilk (because it’s what I had), and sort of guessed at the measurements (I usually measure cups and spoons with an actual cup and spoons). I had to add around twice the milk because the batter was too thick. This may have been due to my method of measurement. I cooked over low-medium heat in a breakfast skillet on a gas stove. The end result was large, fluffy hotcakes. They were only slightly bitter due to the buttermilk (not really noticeable with syrup), so next time I’d just use regular whole milk, and I’d probably only use one egg, because the eggy flavor is definitely noticeable. From now on I’ll be using this recipe when making pancakes. IT IS SO TEMPTING! I HAVE GOT TO TRY EM’! Tried this recipe today and it was a BIG hit, thanks for sharing this awesome recipe. Have you ever tried to make your own Morinaga mix so you do not have to find it in a store?